Gender equality has long been a human right and a core development goal. Yet globally, women still have fewer opportunities for economic participation than men, less access to basic and higher education and receive lower wages than men. They are also exposed to greater health and safety risks, and have less political representation. And women and girls continue to suffer discrimination and violence in every part of the world. FSC defines gender equality as women and men having equal conditions for realizing their full human rights and for contributing to, and benefiting from, economic, social, cultural and political development. 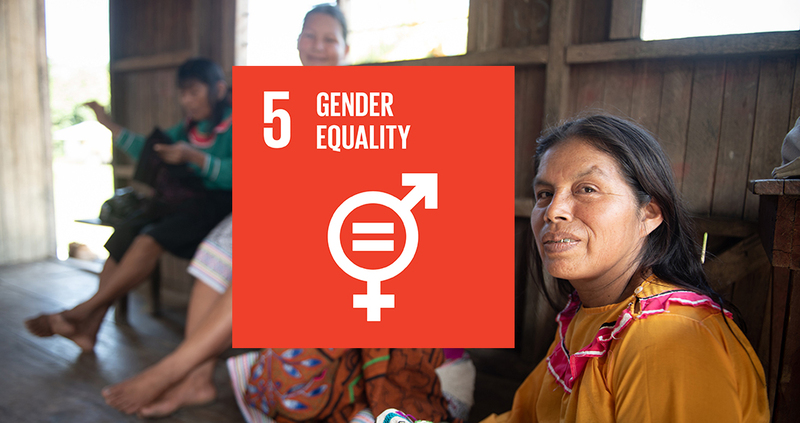 FSC contributes to goal 5 of gender equality through various requirements. To overcome challenges in achieving gender equality in the forest sector, FSC standards require equality in employment practices, training opportunities, awarding of contracts, processes of engagement and management activities. FSC also requires that men and women are paid the same wage when they do the same work. In addition, FSC standard development groups must investigate whether gender equality is secured through national legislation - both in terms of actual legislation and implementation. Where there are gaps between FSC requirements and national legislation, the FSC standard must include indicators beyond national law. Typically these indicators will ensure (additional) training, alternative payment and assignments methods, flexible working hours, parental leave, childcare, etc. 2.2 The Organization shall promote gender equality in employment practices, training opportunities, awarding of contracts, processes of engagement, and management activities. 2.2.1 Systems are implemented that promote gender equality and prevent gender discrimination in employment practices, training opportunities, awarding of contracts, processes of engagement, and management activities. 2.2.2 Job opportunities are open to both women and men under the same conditions, and women are encouraged to participate actively in all levels of employment. 2.2.3 Work typically carried out by women (nurseries, silviculture, non-timber forest product harvesting, weighing, packing, etc.) is included in training and health and safety programmes to the same extent as work typically carried out by men. 2.2.4 Women and men are paid the same wage when they do the same work. 2.2.5 Women are paid directly and using mutually agreed methods (e.g. direct bank transfer, direct payments for school fees, etc.) to ensure they safely receive and retain their wages. 2.2.6 Maternity leave is no less than a six-week period after childbirth. 2.2.7 Paternity leave is available and there is no penalty for taking it. 2.2.8 Meetings, management committees and decision-making forums are organized to include women and men, and to facilitate the active participation of both. 2.2.9 Confidential and effective mechanisms exist for reporting and eliminating cases of sexual harassment and discrimination based on gender, marital status, parenthood, or sexual orientation.